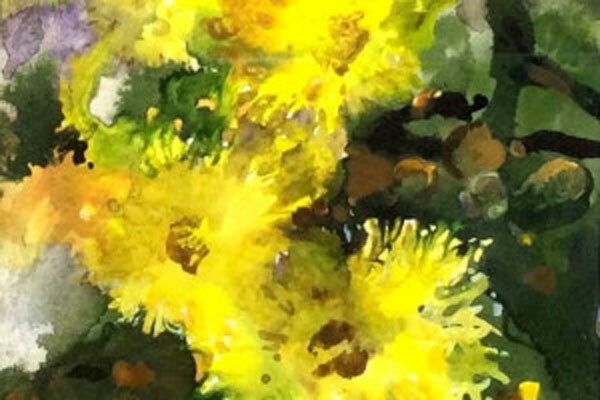 Sue Williams paints primarily in paints using acrylic inks, watercolour, pen and wash and oils. She lives in Norfolk and often works with her partner, John Shave. Together they offer courses covering any subject from pets or boats to the Norfolk Broads. I have always painted and was so fortunate that my parents encouraged me, although they knew nothing about painting. I won a national children’s art competition when I was 10, and that seemed to set the course that my life was to take. I just loved painting and was out painting plein-air from about 7 years old, very inspired by Monet. I was brought up in a flat in Camberwell when l was a child, near Dulwich Picture Gallery and visiting there was a regular treat. I studied at St Martins School of Art on foundation and degree courses. After graduating, I illustrated children’s books, greetings cards, magazines and calendars. After an accident damaged my painting hand, I was asked to care-take an adult education class, and I stayed 25 years, teaching 11 classes a week. 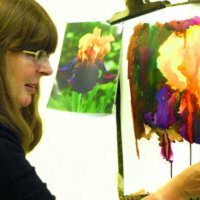 I now teach residential course for art centres and I also teach in my studio in South Norfolk. I demonstrate and run day workshops for art societies. I paint just for myself. I do exhibit sometimes but am often too busy to be able to make hand in and collection dates. I have exhibited in London at The Mall Galleries with The Royal Institute of Oil Painters, The Royal Institute of Watercolour Painters, The Royal Society of British Artists, and in the past with The Society of Women Artists, at Westminster with The Society of Botanical Artists and Britains Painters. I have written for Paint and The Artist magazines. In 2013 I was The Winner of The SAA Artist of The Year Competition.